#0 Round Bottom Scoop--3" x 5": Round Bottom Feed Scoops withstand rugged use. Scoops are made of thick, smooth polished aluminum and come in various capacities and also a flat-bottom style. The length of the bowl of this scoop is 5" and the width about 3". Scoop has a capacity of about 8 oz. and weighs .75 lbs. #1 Round Bottom Scoop--4" x 7": Round Bottom Feed Scoops withstand rugged use. 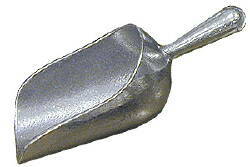 Scoops are made of thick, smooth polished aluminum and come in various capacities and also a flat-bottom style. The length of the bowl of this scoop is 7" and the width about 4". Scoop has a capacity of about 18 oz. and weighs 1 lb. #2 Round Bottom Scoop--5" x 8-1/4": Round Bottom Feed Scoops withstand rugged use. Scoops are made of thick, smooth polished aluminum and come in various capacities and also a flat-bottom style. The length of the bowl of this scoop is 8" and the width about 5". Scoop has a capacity of about 1 qt. and weighs 1.3 lbs. #3 Round Bottom Scoop--5-1/2" x 10-1/4": Round Bottom Feed Scoops withstand rugged use. Scoops are made of thick, smooth polished aluminum and come in various capacities and also a flat-bottom style. The length of the bowl of this scoop is 10" and the width about 5.5". Scoop has a capacity of about 1-2/3 qts. and weighs 1.7 lbs. #8 Round Bottom Scoop--2-1/2" x 5": Round Bottom Feed Scoops withstand rugged use. Scoops are made of thick, smooth polished aluminum and come in various capacities and also a flat-bottom style. The length of the bowl of this scoop is 5" and the width about 2.5". Scoop has a capacity of about 4 oz. and weighs .3 lbs. #9 Round Bottom Scoop--2-3/4" x 6": Round Bottom Feed Scoops withstand rugged use. Scoops are made of thick, smooth polished aluminum and come in various capacities and also a flat-bottom style. The length of the bowl of this scoop is 6" and the width about 2.75". Scoop has a capacity of about 6 oz. and weighs .45 lbs. Choose Scoop Size #0 Round Bottom Scoop--3" x 5" #1 Round Bottom Scoop--4" x 7" #2 Round Bottom Scoop--5" x 8-1/4" #3 Round Bottom Scoop--5-1/2" x 10-1/4" #8 Round Bottom Scoop--2-1/2" x 5" #9 Round Bottom Scoop--2-3/4" x 6"
#0 Round Bottom Scoop--3" x 5", #1 Round Bottom Scoop--4" x 7", #2 Round Bottom Scoop--5" x 8-1/4", #3 Round Bottom Scoop--5-1/2" x 10-1/4", #8 Round Bottom Scoop--2-1/2" x 5", #9 Round Bottom Scoop--2-3/4" x 6"